Two Bears Farm and the Three Cubs: Moms, Pamper Yourself!! A GIVEAWAY! Moms, Pamper Yourself!! A GIVEAWAY! The Multiples and More Blog is celebrating their anniversary with a bunch of giveaways, and I am celebrating with them by doing my own giveaway. Because what mom couldn't use a few things to pamper herself? 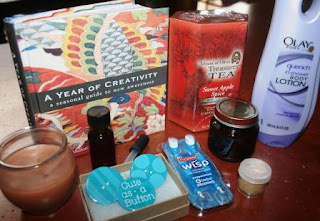 The winner will get A Year of Creativity - A Seasonal Guide to New Awareness, Sweet Apple Spice Mount of Olives tea, Quench body lotion by Oil of Olay, a warm vanilla scented candle, 2 peppermint wisps, homemade vanilla extract, 3 button magnets (to hang up cute picks of your kids on the fridge), homemade chocolate body scrub (this stuff smells so good you'll want to eat it - and technically you can as it's made from all natural ingredients), and homemade strawberry honey lip balm (with just a touch of shimmer). I made the last 4 items myself. :-) I am also going to include one extra item, a surprise, for the winner. To enter, you don't even need to be a blogger! Just leave me a comment about what item you like the most, and make sure you leave a way for me to get in touch with you if you win! Extra entry for being a follower (leave comment). Extra entry for blogging about giveaway and linking your blog to this giveaway (leave comment). Extra entry for participating in Memory Lane Friday, this Friday (theme is to write about a time you got in trouble as a child). Extra entry for tweeting about this giveaway with link (leave extra comment). Winner will be chosen Monday, April 5th. Good luck! The a warm vanilla scented candle sound really good! The homemade strawberry honey lip balm sounds so good!!! That stuff looks great! Hmm some of it looks familiar, from maybe a lovely blog swap we did? :) My favorite thing would have to be the candle. You can't have too many smelly candles. The sweet apple spice tea sounds good to me! I like the 3 button magnets (I make a lot of crafts with my girls). What is my favorite of all of these items? Gosh, what hard treats to choose between! I almost want to say the homemade chocolate scrub and lipbalm, because I'm a sucker for homemade body products...BUT I'm going to have to say the surprise item! It's such fun not to know what that other item is...the wonder the lies in the land of the yet-to-be-found-out, of imagining all of the delicious items it could be! Because I don't know what it is, I'm going to have to say my favorite item is the surprise one! I thought I was following you but I wasn't! Just added myself to the list! What a fun giveaway!! The chocolate body scrub sounds amazing!!!! What are peppermint wisps? Can your mom win? So many treats! How to choose?! I'd have to go with the book. I'm in sore need of a creative boost. My fav is the Year of creativity book! What a great give away! I'd have to say the book would be my favorite part! Sounds great! Oh and I'm a follower now too! My fav would be the book! Whhat a great give away. Oh and I'm a follower now too!